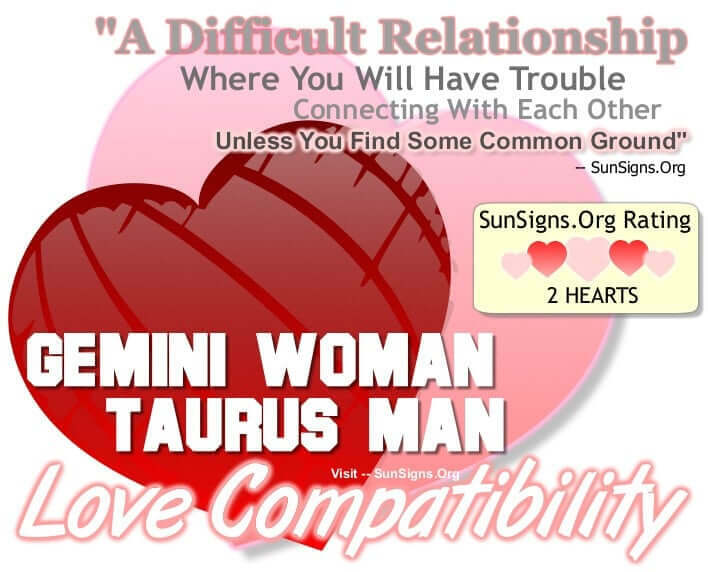 Home » Zodiac Compatibility » Gemini Woman Taurus Man – Difficult But Not Impossible! Gemini Woman Taurus Man – Difficult But Not Impossible! How compatible are Gemini woman and Taurus man mentally, emotionally and sexually? The flighty Gemini woman and the earthy Taurus man may have trouble connecting with each other. But nothing is impossible. He is grounded in the physical realm while she is flying high among the clouds. While the Gemini woman Taurus man soulmates seem to be opposites, these two sun signs can find some common ground. It simply takes work and understanding to make the Gemini woman Taurus man compatibility work. Are Gemini woman and Taurus man a good match? Definitely yes! The Gemini woman in love possesses a brilliant intelligence that the Taurus man finds irresistible, and their conversations will run the gamut on a myriad of topics. Her creativity is intriguing to his curious mind, and she may help to bring him out of his comfort zone. In turn, the Taurus male in love will help to ground her and begin the wild ideas that she sometimes does not have the willpower to complete. Both the Gemini woman and Taurus man in love can learn from each other if the attraction is strong enough. And it can be, once these two hit the bedroom in this Gemini compatibility. Her active imagination always finds ways to satisfy her lover, as long as she remembers that he is a highly sexual creature. The Taurus man sexually needs her to be present in the act with him, not off in a dream world, which will prove difficult for this airy goddess. But the Taurus man’s solid nature can help bring her back to the present, and the Gemini woman sexually always has new ideas for pleasing her lover. He too will have to find a way to stimulate her mind as well as her body, for she may grow bored with his preferred routine between the sheets. Sexually, the Gemini woman and Taurus man in bed would rather spice things up. So it will be a tug of war between her desire for excitement and his need for stability. But his stamina can support anything she throws at him, and this will keep her coming back time and time again. Gemini women will stimulate the imagination of Taurus men in ways they never knew existed. The Taurus in return will help to maintain a more easy lifestyle. Their household will shift from active to passive, and it will take time to blend the two in this Taurus compatibility. If the love in the Gemini woman and Taurus man relationship is strong enough, they may both become great teachers for each other. She can help him to grow by breaking him out of his shell and coaxing him to experience new things. And he can help her to achieve more than she ever dreamed by supporting her ideas and guiding them to fruition. When the Gemini woman is dating the Taurus man, he will find it difficult to keep up with her flight ways, thus leading to a breakup. The Gemini twins cause her to be moody at times, switching from one emotion to the next with little warning. This is tough for the stable Taurus man to handle, for he is as stationary as a rock. She also needs her freedom to roam and find new adventures, while he would rather stay at home for a quiet evening. The Gemini woman Taurus man friendship is a difficult one to maintain, but not impossible. The Gemini woman and Taurus man love compatibility will take work inside their home as well. He enjoys a comfortable lifestyle while she is unpredictable and out seeking new opportunities. She tends to be messy and distracted, which can drive her neat and organized partner crazy. In the Gemini woman and Taurus man marriage, he is the breadwinner and saves his money, while she enjoys spending her finances on anything and everything. The Twin’s love for surprises takes some getting used to, while she may grow tired of his reserved manner. Gemini is a mutable air sign whereas Taurus is a fixed earth sign, the Gemini woman Taurus man compatibility gets a TWO Hearts rating. If the Taurus man allows her the space she needs to roam and the Gemini woman understands his need to stay home, they can take turns making their lover happy forever. This Gemini woman Taurus man zodiac couple can be together with some compromises.